Stainless steel, cherry wood, and porcelain tile really brings this kitchen together. Develop a kitchen that reflects your style and taste, and brings value to the home. 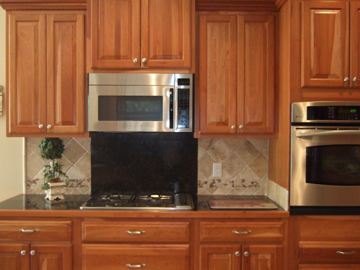 Along with bathroom remodeling, kitchen renovations have one of the best return values per dollar invested. You'll love coming home and cooking dinner with an open, airy, light filled kitchen. Give us a call or request a quote online and lets talk about the upgrade you have in mind.